Hoffmann und Campe is a Hamburg trade publisher in Germany that handles books by young writers as well as literary works by renowned authors. Making content interactively available does not necessarily require apps. Interactive, multimedia EPUBs (enhanced EPUBs) are cheaper to produce, and consumers accept higher prices for e-books than for apps. For Hoffmann und Campe, the EPUBs were enhanced by video clips, slide shows, image maps, explanatory pop-ups, picture galleries, and historic/current maps with seamless cross-fading. Further solutions exist, e.g. for flashcards or tabular display on small screens, which are primarily of interest to educational, technical, and scientific publishers. 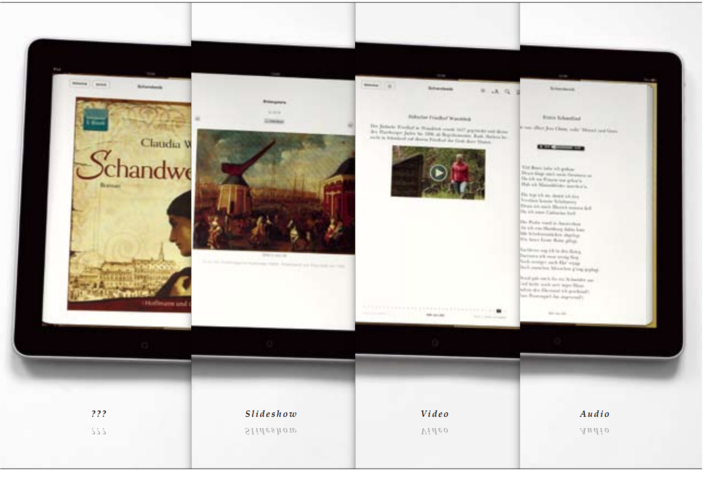 Since 2008, le-tex has supported numerous publishers with the conversion of typesetting data to EPUB and Kindle format. As a member of the International Digital Publishing Forum (IDPF), le-tex plays an active role in the development of the EPUB3 standard.